Adorn your computer like a Christmas tree or rather install a A Christmas Tree Screensaver on your computer. Get into the spirit of Christmas. A Christmas Tree Screensaver brings your holiday to life as you decorate and create your own unique Christmas tree. The screensaver comes with some unique features. You can choose from the wide variety of backgrounds. You can either choose desktop or choose your own favorite color. You can choose fire lit Christmas Eve or let the computer choose a random color. You can also choose from up to 8 different colors of trees. Choose from the available 8 songs that you can select to be played randomly while the screensaver is running. You can also choose from the ornaments from 48 options, tree toppers and tree stands from the four options. The best part about the screensaver is that can be controlled by you or randomly drawn by the computer to create thousands of different holiday trees. Decorate and create your own unique Christmas tree. 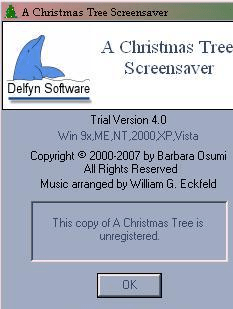 Accompanied by 8 classic Christmas Carols, this screen saver can be controlled by you or randomly drawn by the computer to create thousands of different holiday trees. 48 different ornaments, 9 tree colors, 9 tree toppers, choose from infinite background colors, randomize option, animated falling snow, presents and blinking lights. Wide range of choices for countless colorful variations and fun combinations. Access your documents and software from an animated dock.